A.P. TECHNIC may provide crushing equipment (fixe or mobile), or turnkey desin, including primary, secondary, tertiary crushing with jaw crushers, cones or impactors, screen decks. Our crushing plant outputs are from 20 to 400 tons per hour. 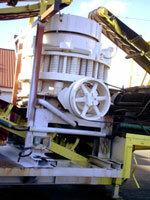 We also rehabilitate unit crushing components and we provide spare parts.